Despite sluggish demand growth in the global steel rebar market, there are continuous new investment projects in many parts around the world, especially in Asia Pacific region. Moreover, China and India, in particular, have the most forceful expansion plans of steel manufacturing of 28 million tons and 31 million tons of new installations, respectively, accounting for 59% of the total increase. Intense competition in the steel rebar industry has resulted in the market becoming commoditized. Steel bar industry players in the past few years have concentrated more on marketing and branding of the product, which is one of the major factor for the growth of steel rebar market in developing countries of the region. With the growing focus on infrastructure and development, the Asia Pacific steel rebar consumption is anticipated to upsurge in the years to come. However, there are some unpredictability in the rate of growth in emerging economies owing to unanswered structural issues, political instability, and unstable financial markets. Goldstein Research analyst forecast the Asia Pacific steel rebar market to expand at a CAGR of 9.0% during the forecast period 2017-2025. Moreover, the market is projected to reach USD 41.2 billion by 2025 owing increased focus of developing countries and underdeveloped countries on urbanization. The report covers the present ground scenario and the future growth prospects of steel rebar market for 2017-2025 along with the total revenue of steel rebar industry in every region. We calculated the market size and revenue share on the basis of revenue generated per segment, region, and country level. The revenue forecast is given on the basis of number of steel rebar manufacturers and current growth rate of the market. Based on product type, deformed steel rebar accounted for the lion market share of more than 70% of Asia Pacific steel rebar market. Further, deformed steel rebar is expected to be the fastest growing segment at a CAGR of +6% during the forecast period owing to emergence of advance processing technologies and high yield and tensile Strength. Asia Pacific Steel Rebar Market Outlook 2017-2025, has been prepared based on an in-depth market analysis from industry experts. 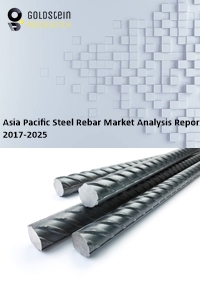 The report covers the competitive landscape and current position of major players in the Asia Pacific steel rebar market. The report also includes porter’s five force model, SWOT analysis, company profiling, business strategies of market players and their business models. Asia Pacific steel rebar market report also recognizes value chain analysis to understand the cost differentiation to provide competitive advantage to the existing and new entry players. Our Asia Pacific Steel Rebar Market Report comprises of the following companies as the key players in the Asia Pacific steel rebar market: Nippon Steel & Sumitomo Metal Corporation, Posco SS-Vina, Co. Ltd, Steel Authority of India Limited, Tata Steel Ltd., Essar Steel, Kobe Steel Ltd., Jiangsu Shagang Group, Jindal Steel & Power Ltd., Steel Asia Manufacturing Corporation, Hyundai Steel and Daido Steel Co., Ltd. According to our Asia Pacific steel rebar market study on the basis of extensive primary and secondary research, one major trend in the market is value added steel rebar products. In recent years, steel rebar grades and product use witnessed a huge change. For instance, the construction industry across the region has started embracing newer grades such as Fe500, Fe550 and Fe500D. Likewise steel rebar usage has been moving towards advanced value added rebar products like corrosion resistant Steel rebar, epoxy coated rebar and earth quake resistant rebar. According to the report, major driver in Asia Pacific steel rebar market is growing rapid urbanization and growing investment in construction sector to develop infrastructure and to speed up the economic growth by developing manufacturing sector especially in developing countries such as India and China among others. For instance, over the next 10 years, China is planning to move 250 million people - comparable of Indonesia's entire population - into the country's rapidly-growing megacities, which led the billions of dollars investment in massive infrastructure projects. Further, the report states that one challenge in Asia Pacific steel rebar market is price volatility of raw materials. The continuously unstable price of raw materials and fragile steel prices have put substantial stress on steel margins. However, steel rebar manufacturers have been continuously working hard to remain competitive in the market. Geographically, China accounted for the largest market share for steel rebar due to the augmented demand from highways, bridges & buildings, marine structures & waterfronts, and other applications such as parking structure. On the other hand Vietnam is witnessing rapid urbanization and industrialization and anticipated to be the fastest growing steel rebar market across the globe, which is expected to expand at a CAGR of +18% during the forecast period.